(Nanowerk News) An invasive seaweed clogging up British coasts could be a blessing in disguise. University of Greenwich scientists have won a cash award to turn it into valuable compounds which can lead to new, life-saving drugs. Dr John Milledge and Dr Birthe Nielsen, from the Faculty of Engineering & Science, have been awarded a £5,000 voucher by the High Value Chemicals from Plants Network to unlock the potential of Sargassum muticum, more commonly known as Japanese wireweed. Dr Milledge, a Research Fellow at the university, says: “This seaweed is causing acute global ecological problems from the Kent coast to California and its destruction is currently carried out at considerable financial and energy cost. 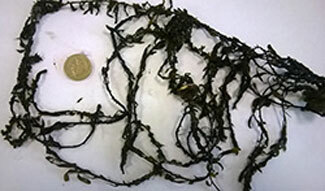 Wireweed competes with native sea plants and is a nuisance in harbours where it can become entangled in boat propellers. The university, a prominent player in algal biorefining, will research the seaweed in collaboration with drug discovery business IOTA Pharmaceuticals. Wireweed is already used in traditional Chinese medicines.